Tribes Aerial Assault is not your typical first person shooter. Its huge outdoor maps and the ability to take off and fly across them alone would make it stand out. Add to this a large array of weapon loadouts and the ability to pilot vehicles from a high-speed Grav Cycle to a slow and powerful bomber, and the argument could be made that Tribes Aerial Assault is in a league of its own. However, what really sets it apart is that it is a console game that is designed primarily for multiplayer, online play. However, this last point brings with it a mixed blessing - Tribes Aerial Assault can provide some great multiplayer action, but falls short as a single player experience. Before taking a look at the differences between the single and multiplayer experience, let's take a look at Tribes' gameplay. The game is set in the 40th Century at the fringe of human space. As new worlds are discovered, their control is contested by "tribes" of high-tech, armored warriors. You are one of these warriors, and you must work closely with your other tribe members to achieve victory. In games of Tribes, you begin with three weapons - a laser blaster, a chaingun, and an explosive-firing spinfusor - your jetpack-equipped body armor, and an energy cell. The energy cell might be one of your most important assets as it powers your jetpack and a number of weapons and items. Additional weapons can be procured by visiting your base's inventory station. You can select heavier armor which will give you more protection and the ability to carry progressively heavier weapons at the cost of speed and mobility. In addition to selecting different armor and weapon configurations, you can also pick up special packs. Some of these packs provide bonuses to you such as shields or an improved energy recharge rate. Others are special deployable items such as remote inventory stations and turrets. There is a certain amount of satisfaction in watching your newly placed remote turret take out an unsuspecting enemy who blunders across it. It is often the case in games with a large number of weapons and special items that control can be a complicated affair; this is not the with Tribes Aerial Assault. The game's designers have done a good job of making control easy and responsive. It does take a little time to figure things out, but with a little practice you'll quickly become proficient at it. You'll rarely find yourself getting killed because you couldn't find the right button combination that you needed to press. The movement controls are very responsive, perhaps too responsive at times. It is easy to build up a lot of momentum, especially when using the jetpack, so you'll find yourself overshooting the location you are trying to reach. This can create some trouble for you when you need to enter a window in a tower to capture the enemy flag as the enemy will have time to close in on you as you are bouncing around the opening like a fly trying to get out of a window. Similar to the inventory stations, Tribes Aerial Assault features vehicle stations where you can pick up a Grav Cycle, fighter, bomber, or transport. The Grav Cycle is a high-speed ground vehicle that will get you into and out of trouble in a flash and is a blast to drive. The fighter and bomber are single-person aerial vehicles that you can use to provide support for your teammates as they assault the enemy base. Control of these vehicles feels slow and sluggish compared to the Grav Cycle and flying around with your jetpack. 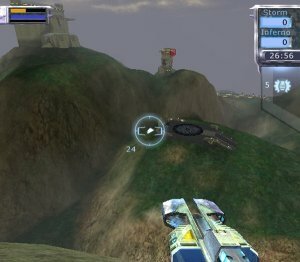 The transport can ferry several players around the map, but it is rarely used in multiplayer games primarily because it requires a degree of cooperation distinctly lacking in most of these games - but more on that later.